When we think of tornadoes we usually forecast their outbreak peak during spring and early summer. However, the weather is turning bad. 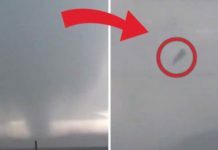 A powerful tornado passed through Adairsville, Georgia, northwest of Atlanta, at 11:19 am EST on January 30 2013, killing at least one person, destructing the downtown and overturning many cars (about 100) on I-75. 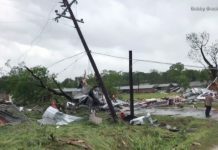 This death is the first tornado death over the last 219 days, a record (Venus in Highlands County, Florida – June 24, 2012). The blue power flashes are triggered as the tornado brings down power lines. 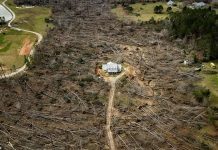 Four other tornadoes hit Georgia on Wednesday afternoon. The largest, southeast of Calhoun, Georgia, injured 8 people at around 11:30am EST. Alabama to Pennsylvania were placed under “Slight Risk” regions for severe weather due to a cold front. This severe weather reported yesterday is related to the record moisture that induced record rains during January 2013.